Hawkeye wasn't just late to the Avengers: Infinity War promo party, he never even got an invitation. 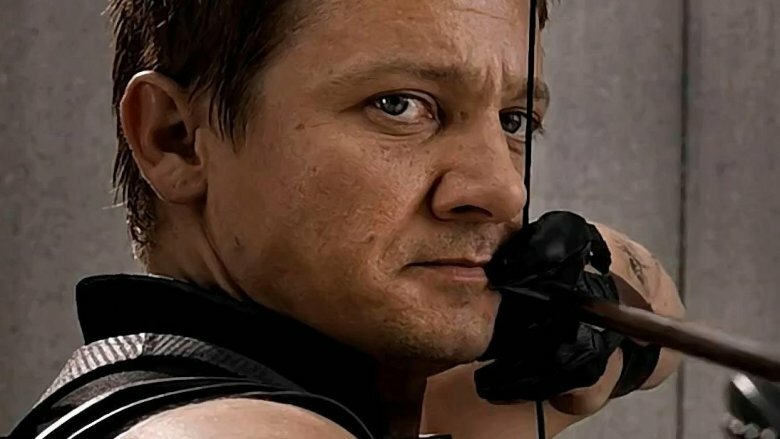 Jeremy Renner's bow and arrow-wielding vigilante has yet to appear in a television spot, marketing photo, trailer, or poster collection (save for the first official ensemble poster) — and people have taken notice. With each new Avengers: Infinity War tease Marvel orchestrates leading up to the film's release, fans are lightning quick to point out that Hawkeye is nowhere to be found. One noteworthy fan has righted Marvel's most recent wrong and crafted a brand-new character poster that gives Hawkeye a well-deserved moment in the spotlight. The mind behind the new Hawkeye-centric Avengers: Infinity War poster is popular digital artist (and mega superhero movie fan) BossLogic, who's known for creating hyperrealistic alternate one-sheets and artwork that reimagines character costumes. BossLogic posted to his 643,000-plus Instagram followers a poster that shows Hawkeye embracing the Ronin identity, which the hero canonically takes up after he rejoins the New Avengers following the events of the seven-issue Marvel Comics limited series Civil War, and sporting an ensemble unlike anything fans have seen him wear in all of his Marvel Cinematic Universe appearances. While the suit design is undeniably badass, it isn't official, and seems to simply be influenced by Ronin's black-and-yellow get-up from the comic books. On Wednesday, Marvel opened the proverbial floodgates and unveiled 22 character posters for Avengers: Infinity War, which saw the film's major characters standing strong and sans-company in shades of pink, purple, and blue light. Four important people weren't included, however: Ant-Man (Paul Rudd), Thanos (Josh Brolin), Loki (Tom Hiddleston), and, of course, Hawkeye. BossLogic's creation, which you can take a look at below, is in direct response to this, as it's designed in the vein of the recently released posters. This isn't the first time fans have taken marketing matters into their own hands and created Hawkeye-heavy posters. BossLogic himself previously unveiled a one-sheet he modified to feature the Avengers' resident marksman in nine different spots. Irish illustrator Philip Kennedy took a turn into the inane by merging the lower half of a group Avengers: Infinity War poster with the top portion of a picture of Hawkeye. "I'm guessing that this is one large fold-out poster and we just haven't seen the bottom half yet," Kennedy explained of his chuckle-inducing creation. Avengers: Infinity War is only a few weeks away from launching in theaters, so it'll be interesting to see if Marvel actually debuts a piece of promo with Hawkeye in it before then, or if the studio will continue to keep the character sequestered. In any case, Hawkeye is confirmed to appear in the film, and we can't imagine Earth's Mightiest Heroes fighting their most dangerous battle yet without their longtime ally in tow. Avengers: Infinity War is set for release on April 27.